February 12, 2015 - (Burbank, CA.) 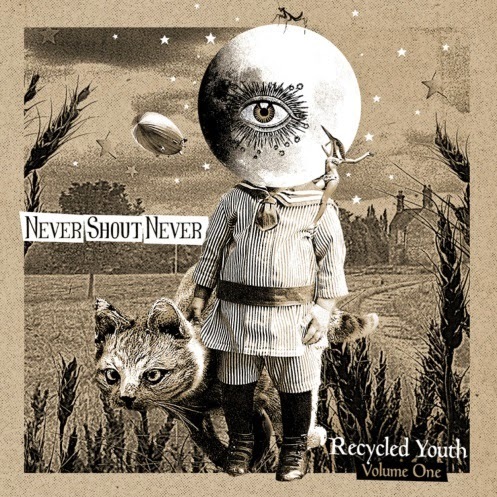 Alternative pop band Never Shout Never, aka Christofer Drew and his fellow band mates, have announced the release of a new album titled RECYCLED YOUTH (VOLUME ONE) on March 3rd. The album is a re-imagining of 9 previously released songs but recorded with entirely new styles and instrumentation to make them unique once again. This album is the first installment of what lead singer Chris Drew envisions to be a three part collection of re-recorded fan and band favorites. "The way I see it, a song is never completely finished. Re-imagined and evolved with each performance", Chris says. "This album is a revamp of some of my favorite NSN songs throughout the years." Stream the new version of "On The Brightside" right now exclusively through Alternative Press. RECYCLED YOUTH was produced by Eric Palmquist (Bad Suns, Night Riots, Wavves, Trash Talk) in downtown Los Angeles, CA. The album will be available digitally on March 3rd as well as physically as limited edition CDs sold on tour and available via a preorder bundle. Click here to pre-order. Later this month, Never Shout Never will be touring the US on their "Mid Winter's Nights Dream Acoustik Tour." Joining NSN on tour is YouTube songstress and former Disney star, Hayley Kiyoko along with Christofer's Loveway Records artist, ME LIKE BEES.